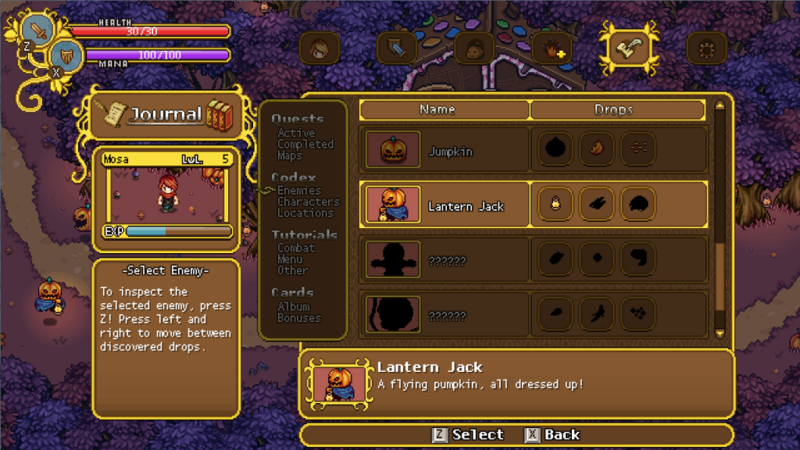 Seriously, though, this blog post will be about the Journal Screen of the game menu! It’s designed to be your one stop shop for the administrative part of being a collector. In the Journal, you’ll find quest logs, information about enemies and NPCs, tutorials and gameplay hints and also the most coveted collection of them all: your Card Album! Click images to view full scale! We touched this subject a while back, but enemy cards are super rare, unique collectibles dropped by nearly every enemy in the game. Of course, only the enemy depicted can drop that specific card! If a card is found, it is put into your Card Album, which is separate from your inventory. 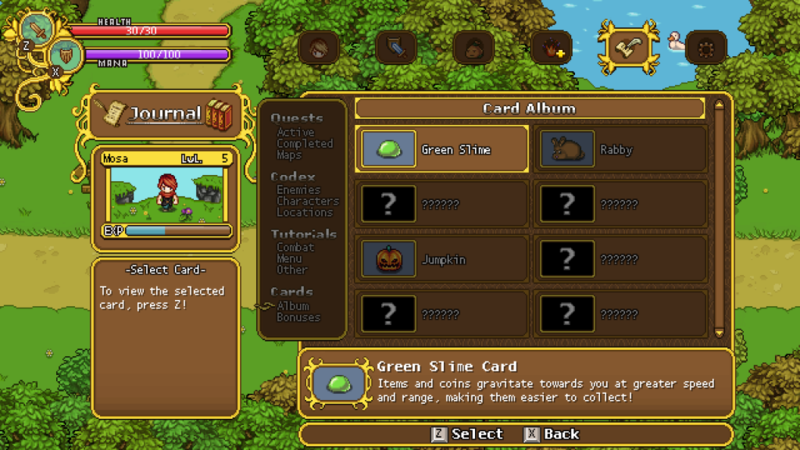 Cards cannot be sold or traded, so they are the true testament to your farming prowess! Each card in the game also have a different passive effect. 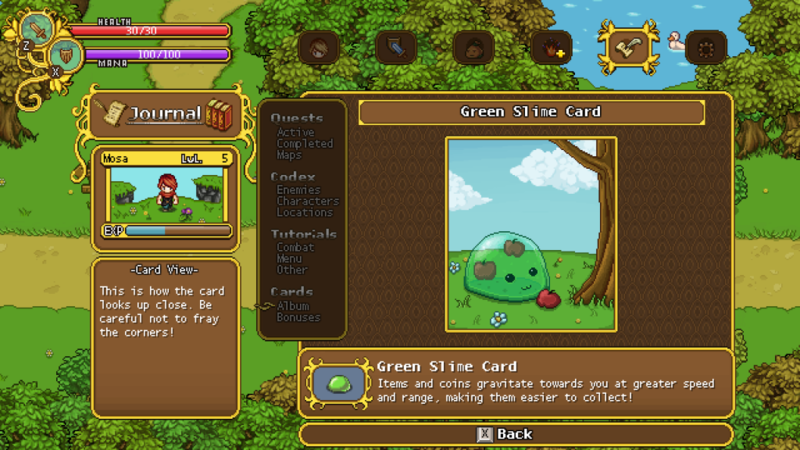 An effect can either be a small boost to a stat, or have a more advanced effect, such as the Green Slime Card in the screens above. They are usually not extraordinary on their own, but if you manage to get a sizable collection, the combined effect will be quite powerful! In the Enemy Codex, you can find out more about enemies you’ve encountered! 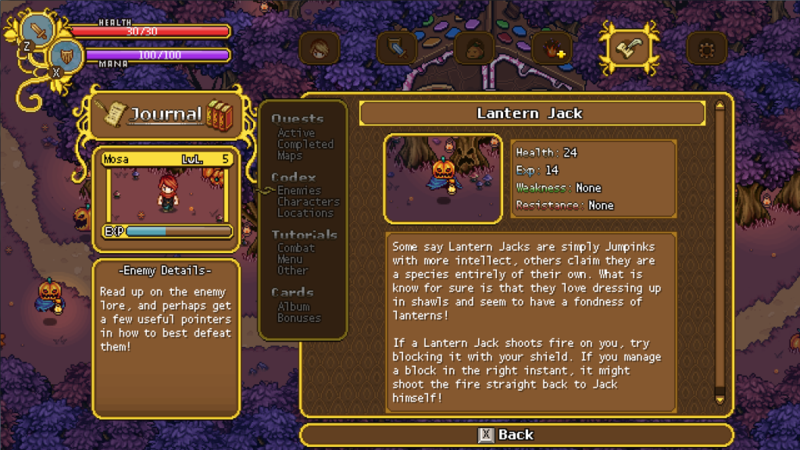 You can find lore and basic stats regarding each enemy, and sometimes useful hints on how to defeat them. The arguably most useful thing about the Enemy Codex for the completionist, however, is the list of all drops that is available next to each discovered enemy’s name! Items you’ve owned at some point are lit up, while undiscovered items are darkened. This lets you know if an enemy type has dropped all it can, or if there might be reason to stay a while and get your grind on! There isn’t that much to say about the Quest Log! 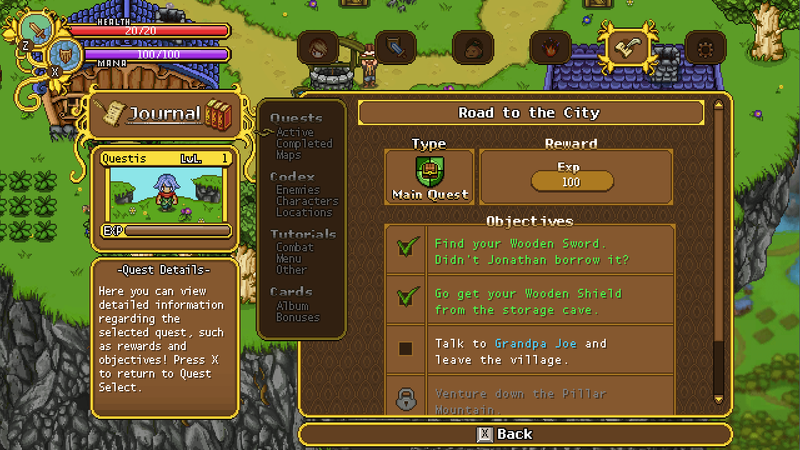 It basically tracks the progress of your active quests, and serve as an archive for your completed ones! If you’re ever stuck on some quest, consulting your Quest Log will probably help you out. Wow, that was quite an exhausting post. Hope you found it interesting! Next week, we’ll hopefully have finished our fishing minigame! We won Game of the Year! 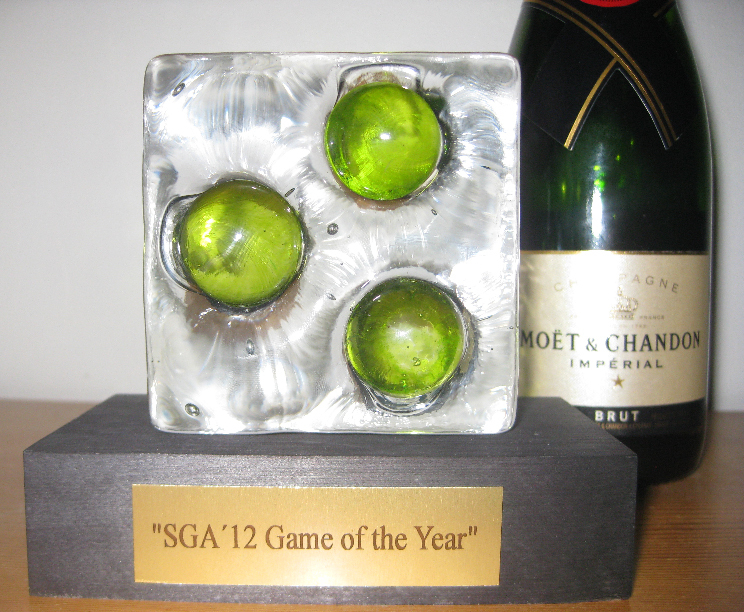 The trophy above, which to the uninitiated looks like an ice cube with limes, is actually a hand made glass decoration inspired by the Swedish Game Awards-logo. It weighs enough to kill a bear with, which is great since bears drop high quality fur you can use to craft sweet hats! While many of you loyal fans believed we’d enjoy an easy win and a free meal, we can assure you it wasn’t a dominating victory by any stretch of the imagination. In fact, the more games we tested on the show floor, the less certain we felt of victory — after all, the only way we could win was that nobody else would, and that seemed downright unlikely. Now don’t get us wrong here, we have the utmost faith in Grindea and certainly feel it deserved to win, but so did all the other games! Forlorn is an amazing iPhone game that not only conquered Best Mobile, but also became nominated for Game of the Year! Its core mechanic is an Ikaruga/Outland-inspired elemental switch, with which you change your element in order to pass obstacles (become fire to resist fire) or kill certain enemies (burning enemies can only be harmed by ice). When this bad boy becomes a fully fledged game it’s going to be one of the highest quality mobile games out there. A Story About My Uncle was our showfloor neighbor and they were nominated to Game of the Year as well. It’s a gorgeous 3D skill jump platformer, where you’re equipped with a special suit that lets you traverse large gaps by pulling its wearer towards objects. Due to a prize deficit rather than a lack of quality, it didn’t win an official reward, but it certainly deserves an honorable mention. Honestly, all nominees were amazing, so do check them out! All in all, the Swedish Game Awards show was great fun, had lovely games (arguably best lineup in an SGA yet) and was an amazing experience. Apart from the prize, we also got a lot of great feedback from people playing it on the floor. The whole event has left us greatly revitalized and optimistic! A huge thanks to everyone who attended the event, and a super special hug to the organizers for the truckloads of blood, sweat and tears that went into making SGA the awesome thing it is. At the end of last week we’ve finally established a little bit of order again. 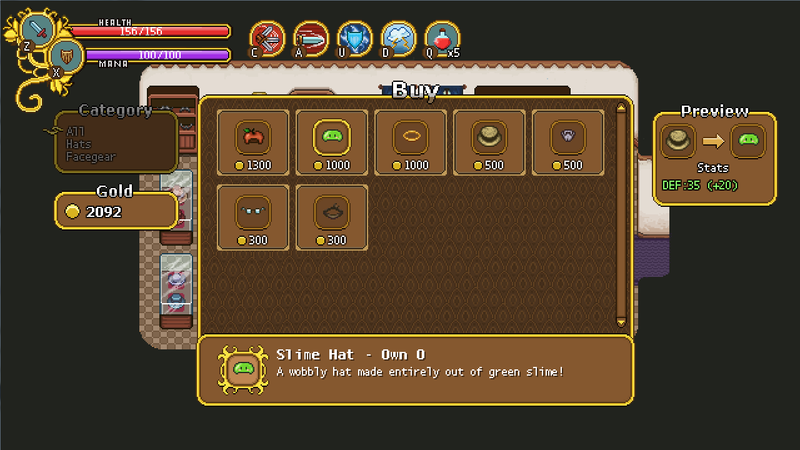 We spent that time implementing shops, so players can finally spend all those coins (or crafting ingredients) they keep finding! 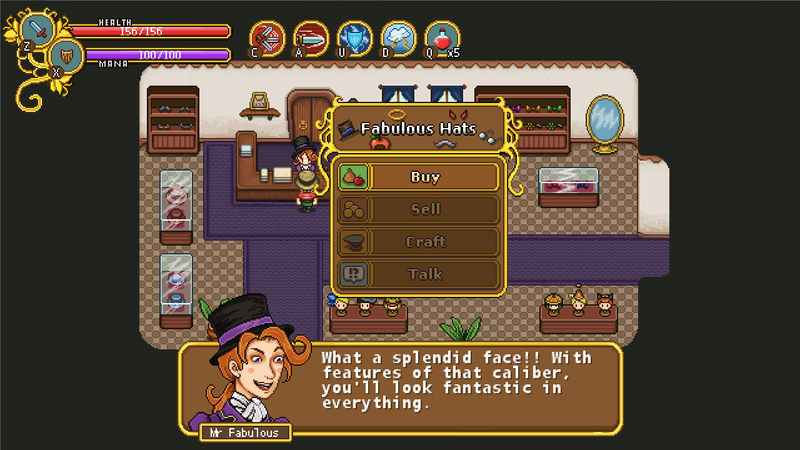 This particular shop is Mr. Fab’s Fabulous Hats, where you can satisfy your vanity with some fancy headgear! 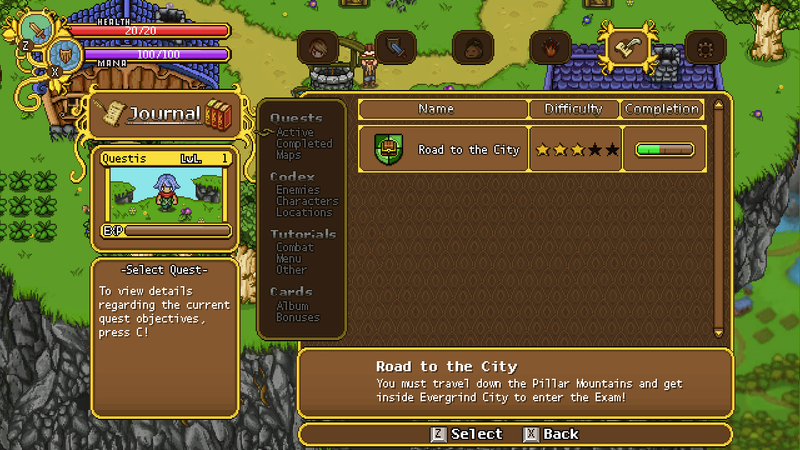 Of course, the selection of all the shops will expand as the game progresses. If you’re having terrible luck with getting sweet drops, going to Evergrind and throwing some cash at the problem is a good backup plan! Also, heads up for followers who might be in Stockholm this coming Wednesday! We’ll be showing the game off at the Central Station from around 8 – 16 (8AM – 4PM), together with lots of other sweet games that made it to the Swedish Game Awards finals! Weekly Recap #29: There’s a Real World Too?? As our studies at the University of Gotland have come to an end, we’ve all moved out of our apartments to go back home for the summer. As it turns out, moving out of a place takes a lot of work that can’t be solved from behind the computer! Who knew? Because of all the cleaning, packing, transporting and then unpacking, there’s not much we can show you this week! Don’t worry, though. We’ll resume the beta crunch as soon as we’ve got our stuff in order! Weekly Recap #28: SGA deadline! Kind of make you wonder how different they will be once the game is done. I have a feeling we haven’t seen the last iteration just yet!